Did you know that during trick and obedience training for us dogs it is a lot easier for us to learn spoken commands in combination with hand signals? We don’t actually “speak” any human language. Actually there’s no such thing between dogs as a “language” either. We have our own way of communication. The barking you might consider our language is only a tiny part of it. Because of our different ways of communication, we’re sometimes having a hard time handling the human way. For example, it can be very hard for us to differentiate between a “Sit!” and a “Seek!” spoken by our humans. The two commands sound just so similar. If they are used in connection to a very clear and distinct hand signal each – a different one for each command, of course – that makes things a lot easier for us. Time to sleep – pile up, guys! Hey guys, I’m back again with some interesting dog facts about me and my peers. Let’s talk about how dogs hear sound today. It’s said that we are among those mammals with the most excellent hearing capabilities: In only 1/600 of a second we are able to locate the source of a sound. Supposedly we are also capable of perceiving sounds from significantly farther away than humans can. But according to scientists that actually depends on the frequency of the sound. Well, it would explain a lot of going furious “all of a sudden”. I mean, is it MY fault that you can’t hear what’s startling me? 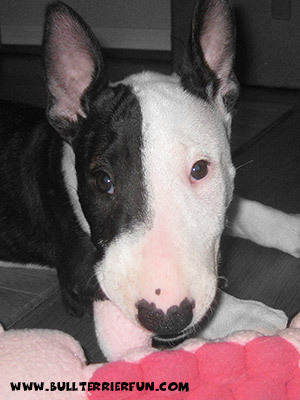 Bull Terriers and all other dogs can hear higher frequency sounds than a human can. So we actually perceive the world differently when it comes to sounds. Did you know that Bull Terriers and all other dogs have more than eighteen muscles in each ear to move it. That is twice as many muscles than a human ear has! It gives us our distinct repertoire of “ear gestures”. They say that ears sticking straight up and being pointed allow for a better hearing in dogs. I don’t know, if that’s really true, because I myself sometimes have such a hard time to hear my masters voice when I am called to come. But it seems to be true that my colleagues with the flappy ears have a more impaired hearing, because the flaps can block vibrations of sound. Another interesting fact is that dogs with a big, square head and large ears (like the Saint Bernard dog) are said to be best in hearing subsonic sounds. You know what’s crazy about that? This guy has flappy ears!!! Did you know that dogs cannot sweat like humans? It’s true, Bull Terriers and all other dogs cannot perspire like humans do. We can only sweat through glands in our footpads. Our cooling system is not very efficient and we cannot lose heat as quickly by breaking out in sweat from head to toe as humans do. In addition to our piddly “foot-AC” we can try to get rid of excess body heat by evaporation from the surface of our tongue – also known as panting. But that is also limited in effect. This is why we easily overheat on hot days in closed spaces, such as cars. So, please do NOT leave us in your car during the hot summer months! It can kill us! Also don’t blame us for diving into that muddy puddle – it’s only to cool our overheated belly a little bit. Cya next time with more interesting dog facts!